This free, printable parental image use permission form should be handed out to mothers and fathers of children in daycare, nurseries, camps and schools concerning pictures and videos of students. Parents can fill out restrictions and guidelines for recording their children and turn it in to teachers. I allow full, unrestricted access for the aforementioned school/organization to take/use photos, images, videos and digital recordings within the institution and display or market said images on their website. I deny any use of my child's image for any purpose. 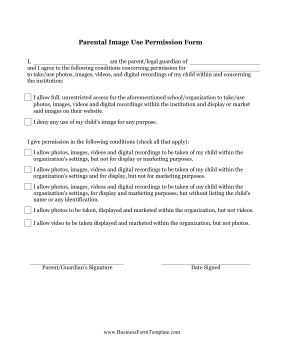 I allow photos, images, videos and digital recordings to be taken of my child within theorganization's settings, but not for display or marketing purposes. I allow photos, images, videos and digital recordings to be taken of my child within the organization's settings and for display, but not for marketing purposes. I allow photos, images, videos and digital recordings to be taken of my child within theorganization's settings, for display and marketing purposes, but without listing the child'sname or any identification. I allow photos to be taken, displayed and marketed within the organization, but not videos. I allow video to be taken displayed and marketed within the organization, but not photos.